When I was a young pup of a Flight Controller in the Space Shuttle Mission Control Center, there was a certain understanding, passed down from the “Old Guard” of Apollo-era Flight Controllers that you conducted yourself in a staid and stoic manner. You had a job to do, you had lives depending upon you, and your behavior was expected to reflect that. Discipline – Being able to follow as well as to lead, knowing that we must master ourselves before we can master our task. Competence – There being no substitute for total preparation and complete dedication, for space will not tolerate the careless or indifferent. Confidence – Believing in ourselves as well as others, knowing that we must master fear and hesitation before we can succeed. Responsibility – Realizing that it cannot be shifted to others, for it belongs to each of us; we must answer for what we do — or fail to do. Toughness – Taking a stand when we must; to try again, even if it means following a more difficult path. Teamwork – Respecting and utilizing the abilities of others, realizing that we work toward a common goal, for success depends upon the efforts of all. To always be aware that suddenly and unexpectedly we may find ourselves in a role where our performance has ultimate consequences. To recognize that the greatest error is not to have tried and failed, but that in the trying we do not give it our best effort. Lately, there has been a trend among non-JSC control centers (specifically, both the NASA JPL Mars Curiosity and the SpaceX teams) of what seems to be a little too much over-the-top exuberance when things that *should* happen… happen. 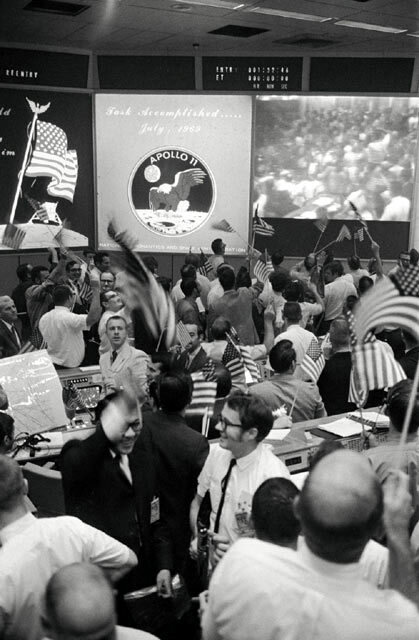 The Apollo 11 MCC team gave themselves about 30 seconds of acknowledgement, but realized they still had a substantial task ahead of them, and the real celebration – as it should have been – was saved for splashdown. I believe that it’s, in large part, due to the real-time social media aspect of information sharing these days – turning cameras-in-the-control-room into live podcasts and instant-celebrity-making out of whomever happens to be in front of the camera. I’ve seen too much hamming-it-up, knowing that they’re going to be on Ye Olde Interwebbes as an immediately-distributed meme… and sometimes, that’s just too much temptation to pass up. I worry that, at some point in the future if this is not addressed, some Flight Controller on some manned mission, or an unmanned mission to a manned spacecraft (are you listening SpaceX? ), will get too preoccupied by mugging to the camera in his face and lose sight of his job… and realize after the fact that his/her performance just led to those “ultimate consequences” with which we JSC Flight Controllers have all too much experience. Well, why did you call some other “young pup” at Building 30 in 1998 “Ms. Doubtfire” just because he had long hair or for whatever reason ? I still don’t get why you called that one out. Hmmm… hope you’ll forgive me if I don’t remember this, though it sounds like you do.